How's this for accomplishing a lot with one little purchase - clip on this battery powered flashing ight to your clothing and stand out three ways: 1) ribbon shape shows you care, 2) reflective surface shows up in headlights 3) bright red flashing light shows up in the dark. Buy our Clear LED Ribbon Running & Walking Safety Light. 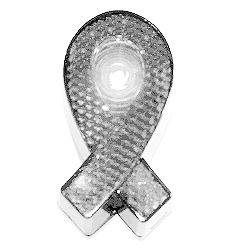 This Clear White Ribbon LED Blinking Light is great for night safety and fundraising. Wear this during your next walk or run; the LED light is visible from a 1/2 mile away. This 1 1/4" x 2 1/2" ribbon light comes with a clip and a sturdy on/off switch for the red blinking LED. Consider buying one for each member of your group.